In our fourth and final Round 2 review of our TourHendricksCounty.com Pizza Playoffs final eight contenders, we highlight a matchup between – No. 8 seed Frank&apos;s Place in Danville, Ind., and the 13th-seeded Piezanos Pizza in Plainfield, Ind. Voting for Round 2 remains open through Monday by visiting our Pizza Playoffs website. To see our previous Round 2 reviews, click here. Reviewed by Jaime Bohler Smith When we rolled out the Pizza Playoffs, I was one of the most excited. Ask anyone in my family, and you will quickly learn that I was raised on pizza, and would eat pizza daily if I could. Heck, we even won pizza for a whole year when I was younger, and my parents are regulars at many of the Danville and Avon pizza joints. I frequent many in the Pittsboro/Brownsburg area. I had Frank’s Place pizza for lunch today, sharing a small Supreme which included pepperoni, sausage, green peppers, large onion slices, and fresh mushrooms. It normally comes with ham and black olives as well, but those were vetoed by my lunch mates today. We also had to try the pepperoni breadsticks – which I had not had for awhile. The restaurant is located on the Historic Courthouse Square in Danville, having rebuilt in 2001 after a fire. Walking into the front door you see the open kitchen where Frank makes the meals and his wife Brigette helps you find a seat. The two-story building is completely open on the inside, the high ceilings showering patrons with plenty of natural light. The restaurant also has a small bar and serves other dishes including pasta, chicken, seafood, soups and large salads. My favorite part of the pizza was the crust. It tastes and feels homemade, and you can certainly tell the difference. The crust is considered hand-tossed, and goes from thick and fluffy crust to thin but ample in the middle. The toppings were also very fresh, and were just the right amount – not too much that they fell off when you picked up the pizza, but certainly enough to savor the flavors of all the toppings. All said, it was a great pizza. I’ll be back, and will be adding pizza to my normal Frank’s Place meal rotation. Reviewed by Jaime Bohler Smith For dinner, I headed to Plainfield and had my husband and son with me to taste test. Piezanos Pizza is located on the north side of U.S. 40 in a small strip mall with floor to ceiling windows. They only offer carryout and delivery, so I called in my order ahead of time. When I arrived, it was a true pizza place - pizza boxes were stacked floor to ceiling and coolers lined the outside pick-up area with all kinds of soda to choose from. 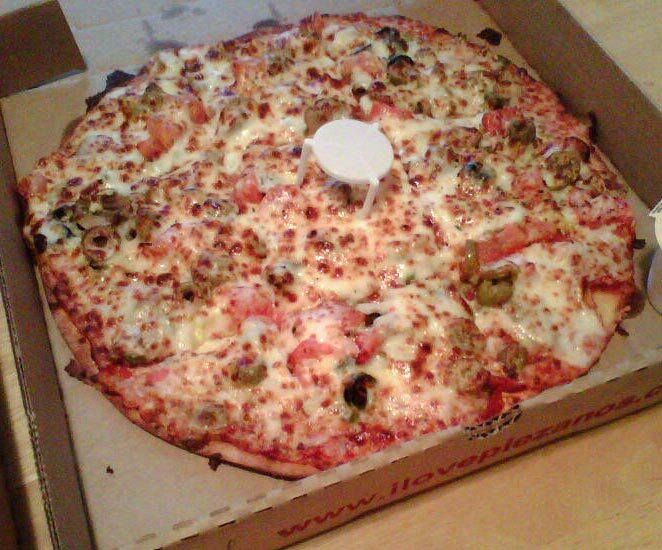 We ordered two medium pizzas - the first a specialty pizza on thin crust called the Veggie Delight featuring mushrooms, onion, green peppers, banana peppers, black and green olives, sliced tomato, cheddar monterey jack and mozzarella cheeses. It also comes with pineapple, cucumbers and jalapenos but we opted against those items. 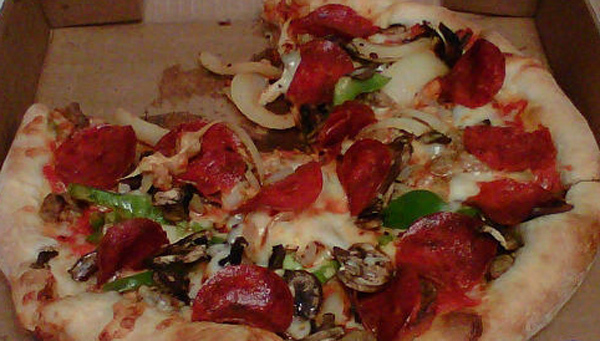 We also got one on the traditional crust with just sausage, pepperoni and mushroom. Of course, we picked up some breadsticks as well. When we returned home and dug in, we found a real treat in the Veggie Delight. The olives (especially the green ones) were plentiful, and the banana peppers were just the right amount. A minor disappointment was the canned mushrooms versus fresh. However, our mushroom loving little guy didn&apos;t seem to mind as he screamed, "more mushrooms," across the table. The other pizza showcased the crumbled sausage, which mixed well with the sauce. There wasn&apos;t a lot of sauce on the pizza, so I took to dipping mine in ranch, which was pretty tasty. With our breadsticks, we got a side of their marinara, and could see the oregano and parmesan used to season the mixture. Overall, I preferred the Veggie Delight, and I&apos;d love to be brave enough next time to add those more exotic ingredients that we left off tonight.